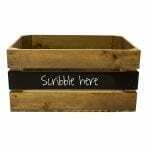 Our rustic wooden crates are reminiscent of distant memories from our childhoods; toy tidies, blanket boxes or the ever greasy tool box. Whatever may be your trigger, wooden crates are as popular as ever. Wood has always been a preferred material of choice and with the rising concerns over plastic more and more are looking back to wood for solutions. In terms of storage wood is a breathable material resisting the build up of unwanted moisture. Our wooden crates, with their classic slatted design, allow for storage with even greater airflow. Health Benefits - who'd have known? Aside from the aesthetic look of wood there are also health benefits to this natural product. Many synthetic materials such has polycarbonate plastics and epoxy resins contain bisphenol A . This is also known as BPA. Much research is raising concerns over this industrial chemical. 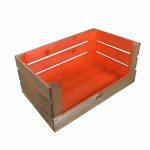 Another great aspect of using wooden crates over synthetic alternatives, is you can add to it at any time whilst maintain your design. Plastic boxes can be out of stock or change in design, colour or supplier whereas ours, like the wood it is made from, is always available. We have seen some fabulous uses of our wooden crates by customers. 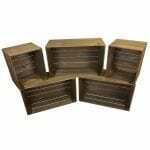 These include bathroom storage, kindling crates, fire wood crates, toy boxes, muddy boot boxes and more. They can also have a lid added to keep the contents secure. The lid also allows them to double as a side table or coffee table and are even sturdy enough to become extra seating on occasion. 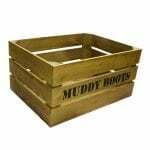 All our rustic wooden crates can be customised to your specific requirements. 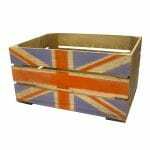 From our rustic crates to painted crates and our famous Colour Burst Crates, drop front crates, blackboard crates, union jack crates, stencilled crates and much, much more we have something for everyone. Our crates are so versatile they can also be used as shelves and attractive displays. Our colour burst crates used in these crate wall displays are really something to behold. 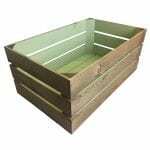 You can build your own to your own style or select some of our standard crate displays. As storage solutions they are second to none in terms of style and versatility. 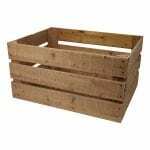 Browse through our wooden crate range and explore how our wooden crates can work for you.